CGI studios have a standard trick used for establishing the reflected light on digitally created images for movies. 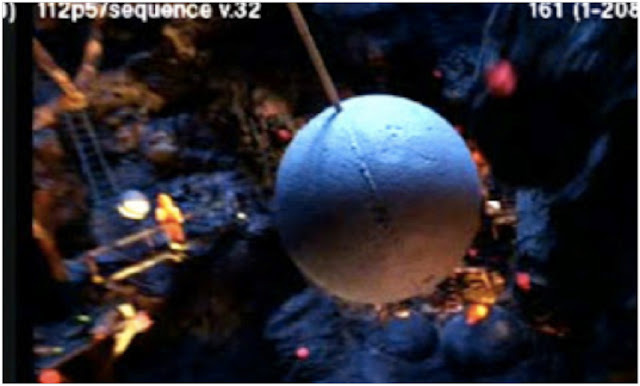 A large mirrored or matte ball on a stick is placed prominently in the shot. They use this because the ground and sky are not always visible in the finished shot, but CGI artists need to know the color of each so that they can correctly judge the reflected light cast on the digitally created element in the shot. 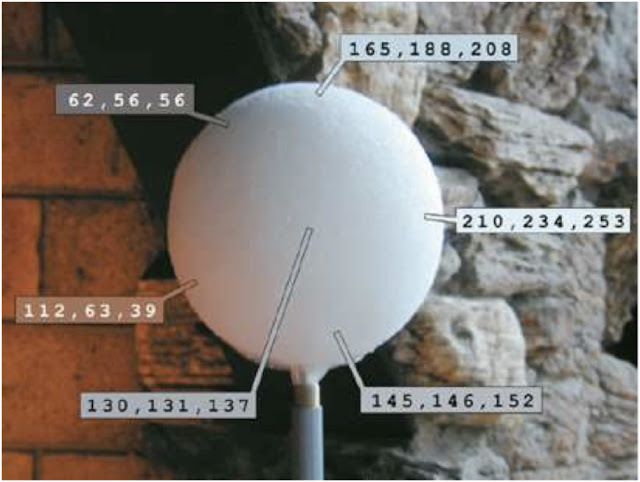 RGB readings (above) from a matte-finished grey reference globe positioned in the set give accurate colors and lighting positions for CGI artists to base their digital 3D paintings upon. You can see from the six RGB numbers taken from this photo that there is a lot of information to consider regarding light, either reflected or direct. The good news as far as illusionistically painted architecture is that we don’t concern ourselves with this level of detail. It’s good to understand the reality, but it would take way too long to paint. For the most part, reflected light is rendered in one tone only. In fact, simply leaving the mid-toned background showing along a crescent strip – and not adding any extra painted step - often suffices for the representation of reflected light on architectural ornamentation. Decorative painting is all about developing shorthand, and any step that can be cut out means less time spent (and more money in your pocket). The standard rule for reflected light is that the lightest dark in the shadows should never be lighter than the darkest light in the lights. It sounds confusing at first, but it makes sense if you think about it. There is a tendency to overdo reflected light. Sometimes the reflected light looks too bright, and the successful modeling of form is compromised. Generally speaking, keep any reflected light relatively dark. 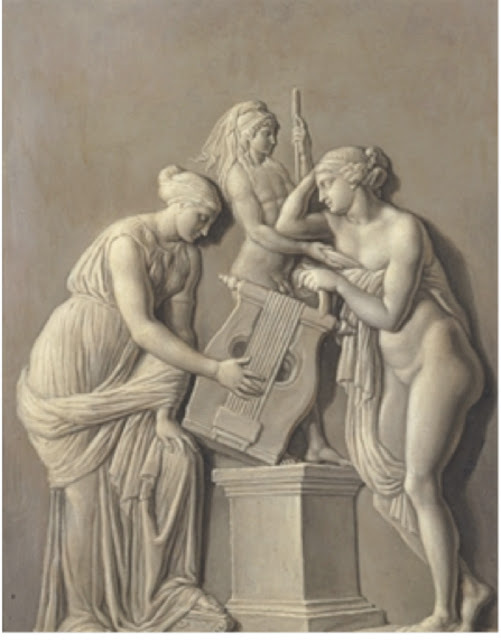 Piat Sauvage was a master at painting grisaille bas-relief imités, but his use of exaggerated reflected light on the right side of the naked woman in “An Allegory” (above) illustrates my point. The overly emphasized light bouncing back onto the legs and torso [from what source exactly?] ruins the illusion of three-dimensionality, and gives the game away that it is paint, not plaster, that we are looking at. The section of molding in the wallpaper by Xavier Mader (above) demonstrates my point about reflected light as it is normally rendered in decorative painting. 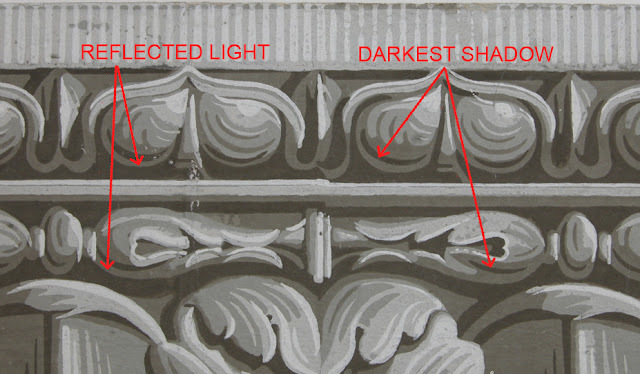 You can see that the area of reflected light is created by simply shifting the darkest shadow away from the lower edge of the ornament, leaving an area of dark mid-tone showing. A very interesting and useful discourse. It reminded me of a brown shopping bag I saw at Christmastime some years ago. The bag was the same brown that we associate with grocery bags, and it was overprinted with a simple yellow and brown design, giving an incredibly believeable impression of gold. I wish I'd saved the bag — today I'd blog about it . . . I actually think it's the tight cast shadow behind the reflected light on the figure on right that destroys the illusion. You could be right. The cast shadow is too dark (if we assume that this is a representation of white stone). Perhaps it's the darkness of the cast shadow that makes the reflected light appear so bright. Thanks Barbara. I wasn't familiar with Faber Birrens but I found a bunch of PDFs online of his writing and look forward to reading them.